Notes: 1 Linear trend is significant based on a weighted least-squares regression test (p < 0.05). Among adults 65 years of age and older. Estimates are based on 2-year averages. Visit rates are based on the July 1, 2012 and July 1, 2013 sets of estimates of the civilian noninstitutionalized population developed by the U.S. Census Bureau’s Population Division. 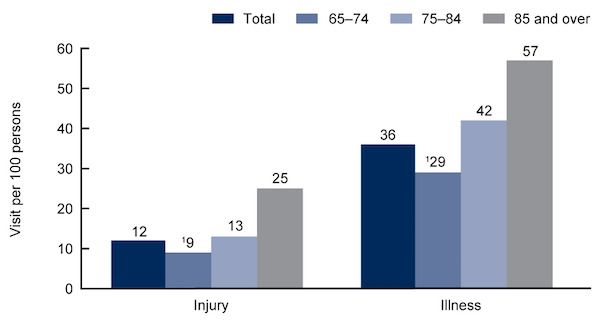 Data Source: NCHS, National Hospital Ambulatory Medical Care Survey, 2012–2013. This entry was posted in Medicine and Society Data Watch on March 1, 2017 by Genevra Pittman.